Part one of my questions for this coming season: does it matter that there’s only one ball? On Oklahoma City and Houston's star acquisitions. I used to collect baseball cards as a kid. I had a lot of fun organizing them in binders, looking up the values of the rarest ones in pricing guides, and coming up with trades with friends. But nothing compared to the feeling of holding an unopened pack of cards in my hand, the foil wrapping crinkling loudly as I slowly eased it open and imagined what could be inside. I get the same feeling at the start of every NBA season. There’s a lot to be excited about when the NBA starts again, but for me no part of it is more exciting than that feeling of suspense as we get ready to find out how all of the new teams, new players, and new schemes play out. We get to learn the answers to our questions. We get to find out what’s inside the pack. It’s not just about watching the story unfold, though. It’s about learning from it as we go. Every year there are questions we have going into the NBA season, and this is our chance to find the answers — and hopefully be able to apply what we learn to the future. The top three things I’m hoping to learn from the 2017-18 season? Does it matter that there’s only one ball? How will the evolution of the big man continue? Will the plus-minus machines keep humming on new teams? I’ll address each of these in separate articles. Here is the first. This is not the first time we’ve had the debate. Every time multiple, ball-dominant players team up there’s skepticism that things will work smoothly. This makes sense: if a player’s main value is creating offense for others and now you limit how much they have the ball, you’re limiting their value — perhaps even destroying it. 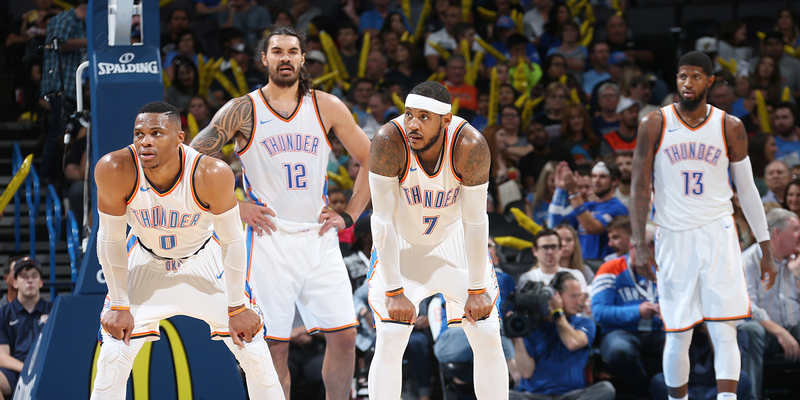 Two teams’ offseasons have revived the debate: Oklahoma City, by trading for Paul George and Carmelo Anthony, and Houston, through their acquisition of Chris Paul. The Rockets already have James Harden, of course — the NBA’s second most ball-dominant player last season. The only player who had the ball more? Russell Westbrook of the Thunder. The immediate responses to these moves seemed to be laced with a healthy dose of doubt. After all, there’s only one ball. Could this really work?